Some may call it ugly. Others think it’s washed up and just plain poor web design. 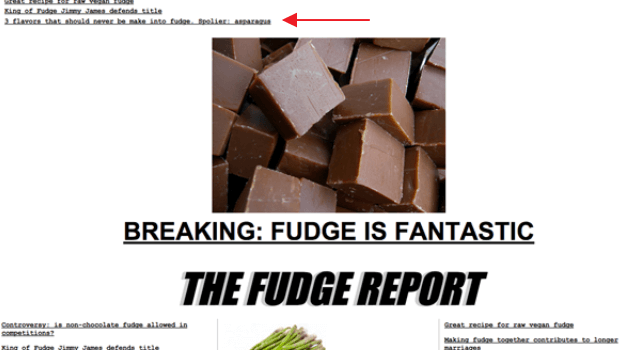 And yet, many people still maintain that the Drudge Report is a timeless classic that has withstood the test of time. And in a sense, they are all true. Debuting in 1997, the Drudge Report has seen very little change in terms of design. It is written in unscripted HTML, holds a monochromatic color scheme, and never spices up its boldfaced, moonfaced font that appears on a plain white background. In addition, it would seem that the images and links are all mixed up with no sort or organized order. That is, besides the one major headline that jumps out at you upon clicking on the site. Here at WP Mayor we have expressed the importance of content aggregation and curation for establishing your website as a go-to resource for breaking news in your niche. 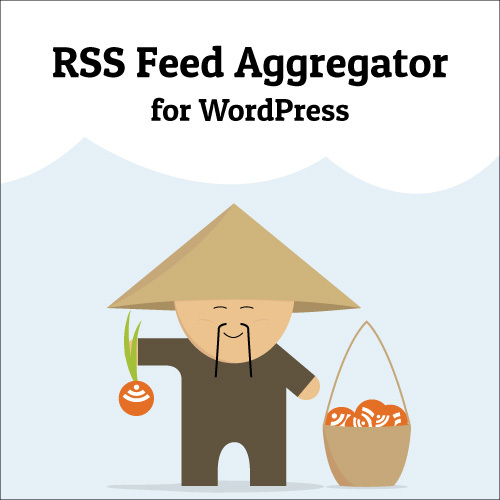 In fact, we have even shared with you some of the best aggregator themes for WordPress so you can set your website up to become one of the best news sites around. However today we are going to get into specifics. Today we are going to show you how to set up a Drudge Report clone on your WordPress website using the premium WP-Drudge WordPress theme. 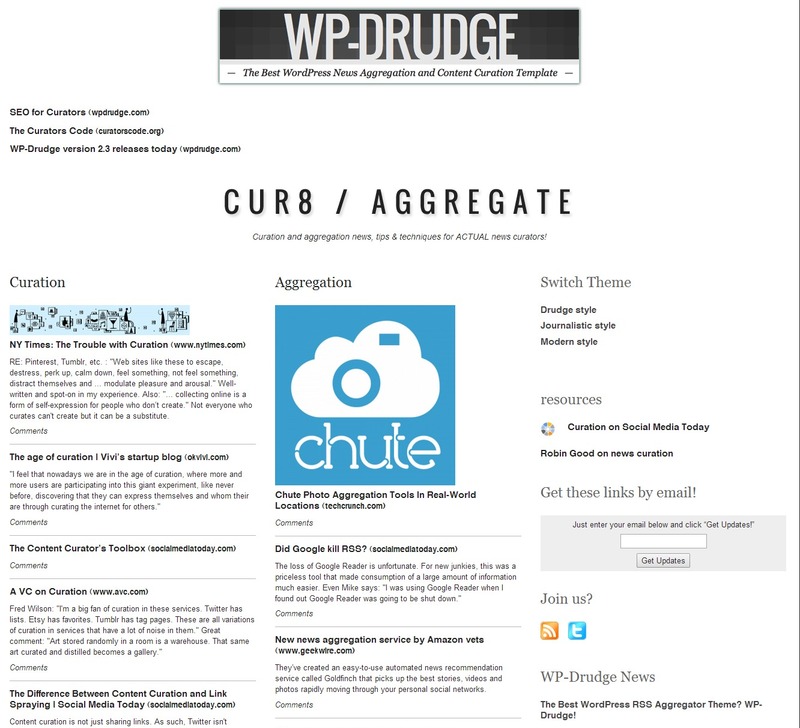 WP-Drudge is a WordPress news aggregation and content curation theme designed to mimic the popular Drudge Report website. In short, WP-Drudge is a user-friendly theme that allows you to create, maintain, and even promote a news curation website. In the end, this WordPress theme has all the required functionality to create a Drudge Report clone. 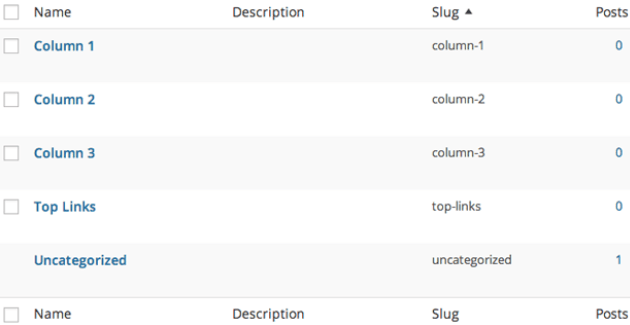 In order to get started with WP-Drudge, you first need to install and activate your purchased theme via your WordPress dashboard. Navigate to Appearance > Themes and click on Add New. Then select Upload Theme and choose the WP-Drudge zip file. From there, download the theme package by clicking on Install Now and then select Activate. Before you can start customizing your WP-Drudge theme, you must then navigate to Settings > WP-Drudge License and enter your API key and email address. Posted Links. These are posts that are “time sensitive” links on your website. They appear newest to oldest and display vertically. They will fall off your homepage after a specified time and remain in your archives. Static Links. These are your links that stay on the site pages as long as you want them to. They link to major headline news and appear however you want – alphabetically, by rating, or random. When comparing to DrudgeReport.com, Posted Links are the news links at the top of the homepage and Static Links are the outgoing “blogrolls” at the bottom of the site. Your WP-Drudge homepage is broken into multiple columns. Each column contains small blocks of dynamic content that are organized using “widgets”. These “widgets” are for displaying content easily on your website. This is where all of your links will appear on your homepage. 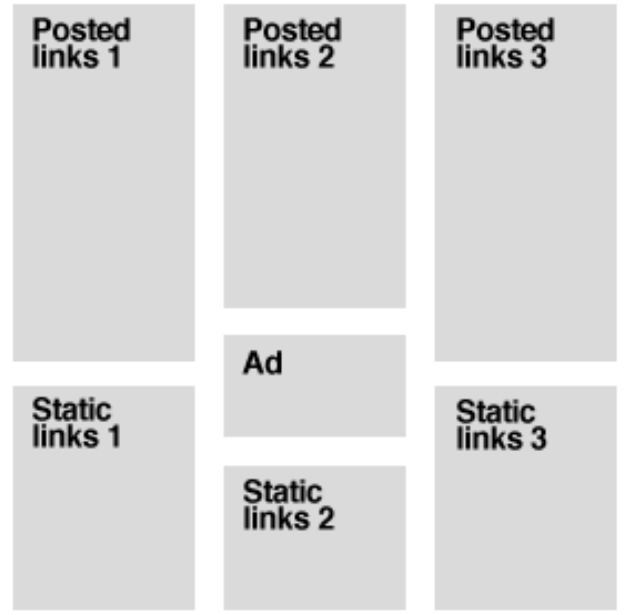 That being said, any of the default widgets you initially deleted when adding your Posted and Static Link widgets can also be used on your website by simply re-adding them. 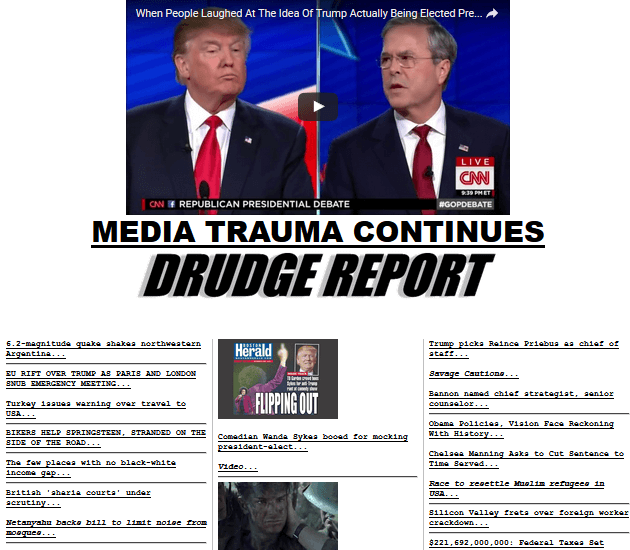 While many people feel a Drudge Report website is unsightly, there is no denying its specific look and feel. 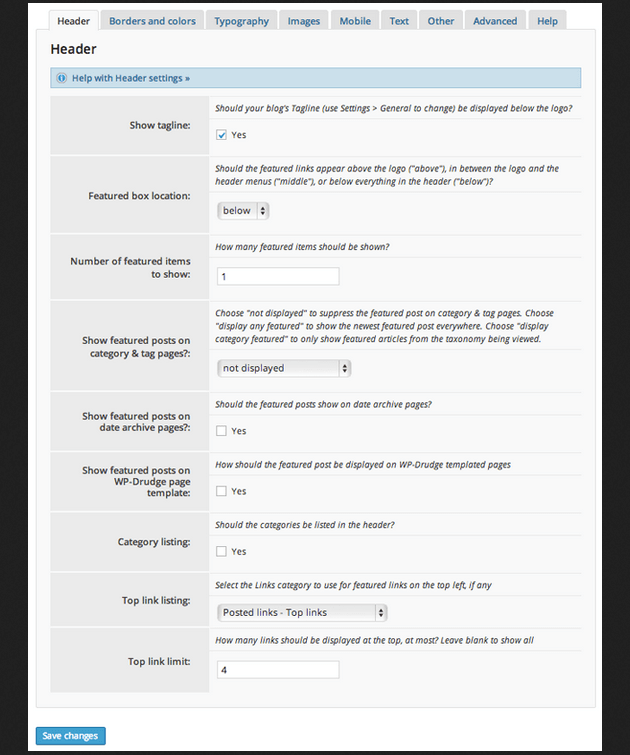 To begin customizing the overall look of your website, navigate to Appearance > WP-Drudge Options. In addition, you can alter things such as your content width and layout, overall spacing, number of columns, link behavior, redirects, and footer text via the Other tab. More so, you can access additional customization options in the Advanced tab where CSS changes can be made. One of the best features WP-Drudge has that makes it so similar to the Drudge Report style is the editorialized headlines that link to similar external website sources. It is in this way you create a consistent and unified opinion across the board that your readers come to know and love. Notice too that you can make breaking news the headline by checking the “Featured Link” box. In addition, you can add important links to the left above the headline story by checking the “Top Links” category. In the future, the developers of WP-Drudge hope to implement a feature such as an analytics tie-in with Google Analytics and include child themes for customizing the category pages. Altogether, the WP-Drudge theme provides the perfect canvas for creating a Drudge Report clone website. In fact, you can set up an almost identical looking website if you wish and begin curating news just as the original news curation website has been doing for almost two decades. I must admit that the learning curve is a bit steep for a theme of this capability. Being so unorthodox when compared to other themes, navigating through the steps can become a bit confusing if you do not commit to following the documentation step-by-step. However, the documentation is thorough, so as long as you follow each step accordingly you will be able to have your Drudge Report clone website up and running in no time. 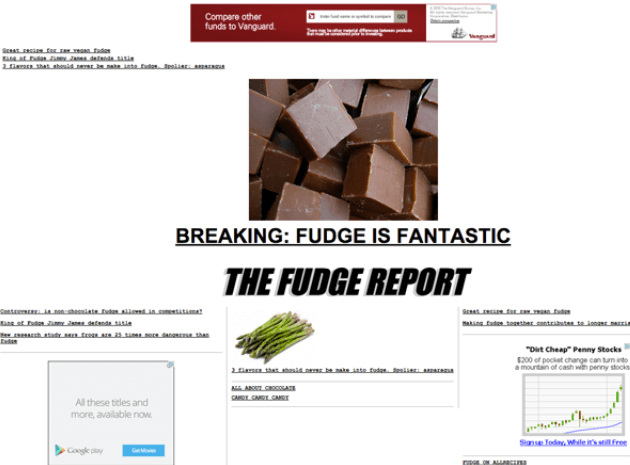 Have you ever used the WordPress theme WP-Drudge to create a Drudge Report clone? I would love to hear all about it in the comments below! Thanks for stopping by WP Mayor! I am glad you enjoyed the post about creating a drudge report clone. Be sure to check back for more great WordPress information. You both are so welcome! I am so happy to have provided you guys with help. I know it can be kind of confusing at first, but once you get the hang of it, it’s a whole lot easier!